In 1970, a little movie called Airport debuted in cinemas nationwide, and it was such a huge blockbuster that it ushered in a new genre known as the “All-Star Disaster Movie.” For most of the 70s, these movies were a mainstay, but like so many other movie fads, the quality began to decrease exponentially. 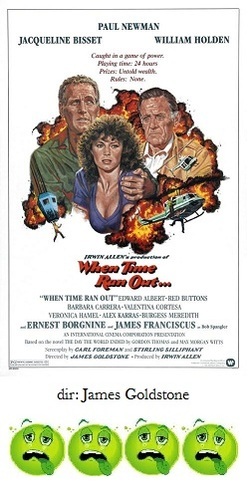 After the other kings of the genre, The Towering Inferno and The Poseidon Adventure, came the increasingly lame Earthquake, Avalanche, Hurricane, City on Fire and The Cassandra Crossing. The fad had pretty much bottomed out in 1978 with the godawful The Swarm, and that should’ve been the end of it. Nobody bothered to tell the film makers of 1980’s When Time Ran Out… that, well, time ran out on the popularity of the disaster picture. For When Time Ran Out… we are on a tropical, Pacific island that also has a temperamental volcano. Our motley crew includes oil driller Paul Newman, who is at odds with real estate developer James Franciscus, along with love interest Jacqueline Bissett, William Holden, Burgess Meredith, Barbara Carrera, Red Buttons, Valentina Cortese, Edward Albert, Ernest Borgnine, and Alex Karras (his only concern is his prized fighting rooster! ), etc. as various business people, residents and vacationers. The conflict arises in clichéd fashion as Newman becomes more and more concerned that the volcano will erupt and Franciscus who doesn’t believe it will and doesn’t want to cause a panic. Also present are a group of scientists who’ve built a lab at the edge of the volcano and they even have a handy glass (!) elevator to take people down inside. And even after Newman and Franciscus are nearly baked alive inside the elevator, Franciscus still thinks warning all of the people in the hotel located at the volcano’s base would be “damn irresponsible.” Now we simply wait until the volcano finally blows and we can get on to the carnage. So, the volcano goes bang and the cast gets knocked off by plunging into the lava flows, getting obliterated by giant fireballs, falling out of helicopters, getting crushed by statues and being wiped out by tidal waves. This all sounds like much more fun than it is. The reason could be due to the truly lousy special effects, phony-looking model buildings and dreadful blue-screen trick photography. To give you an idea of how badly planned the whole production of When Time Ran Out…is , the big set piece involves several of our survivors attempting to cross a bridge over a river of lava. This scene goes on for over 20 agonizing minutes, as we watch these dolts sloooooowly cross this bridge. The meant-to-be-suspenseful moment when Burgess Meredith transports two children on his back while he carries a balancing rod (most of the bridge has collapsed by this point leaving only a thin, metal beam) only manages to elicit snickers. refined tastes (i.e. just about everyone else) there really is no reason to throw two more hours to the winds.